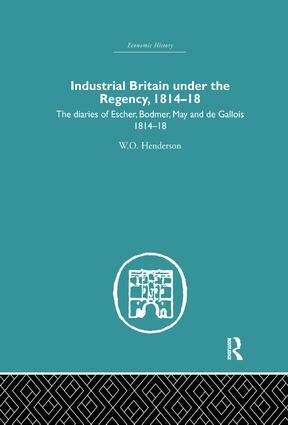 In this book W. O. Henderson has brought together in English translation the journals of four foreign visitors who travelled in England and Scotland in the years immediately following the Napoleonic wars, in a way which may be regarded as a sequel to his recent book on J. C. Fischer’s diaries of industrial Britain. Two of the travellers whose journals are included in this volume were Swiss industrialists. Hans Caspar Escher was both a professional architect and the founder of the famous engineering firm of Esther Wyss of Zürich, Bodmer, also of Zürich, lived in England for many years and was recognised as an inventor of genius. The other accounts of industrial Britain in the Regency era are a report by the Prussian Factory Commissioner May and a short survey of the Newcastle upon Tyne colliery railways by the French government engineer Louis de Gallois. The four diaries show how informed foreign visitors were impressed by the way in which Britain had survived the perils of Napoleon’s Continental System and was now forging ahead to consolidate her position as the workshop of the world. This book was first published in 1968.